Facebook app updated for Android and iPhone | Android Blast! 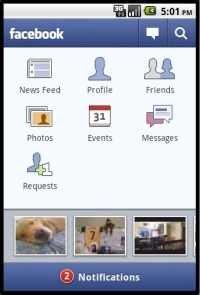 Along with the Facebook Mobile announcement today came updated apps for Android and iPhone users. The new app looks basically the same but it has a few updated features. Facebook's mobile app now supports check-ins with Places, Groups, and notification improvements. Check out the Android Market or the App Store for your particular flavor of Facebook.